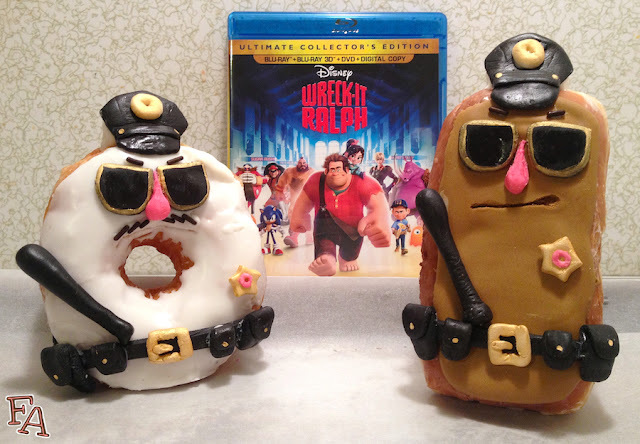 Fiction-Food Café: Doughnut Cops from "Wreck-it Ralph"
Doughnut Cops from "Wreck-it Ralph"
Wynchel & Duncan are the doughnut policemen (shown in the scene above) in the fictional video game "Sugar Rush Speedway" from the Disney computer animated film "Wreck-it Ralph". 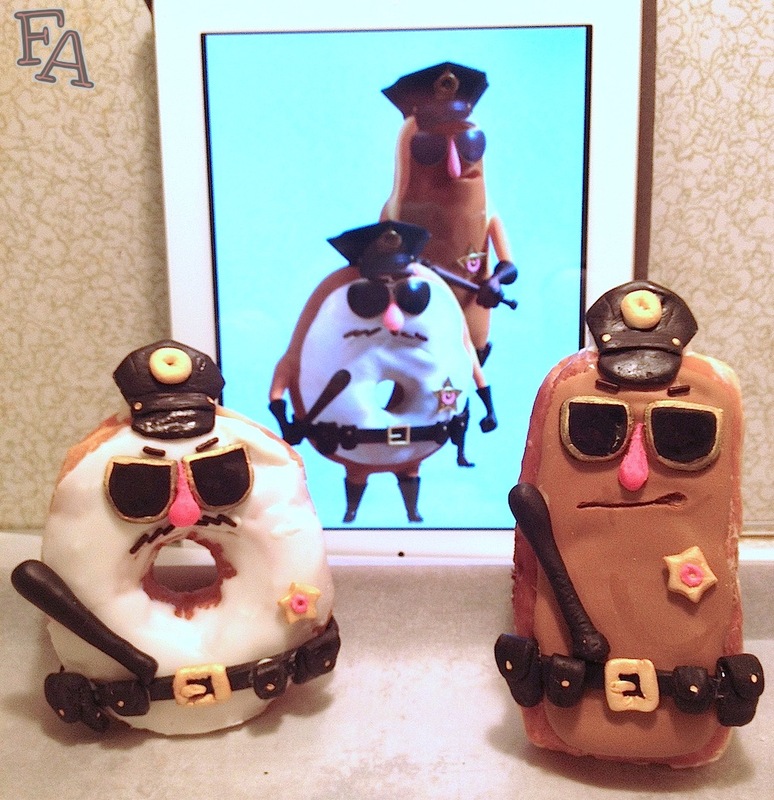 These doughy dudes were inspired by, you guessed it, the stereotype of law enforcement's love of doughnuts. The names Wynchel & Duncan, Wynchel for the tall one and Duncan for the round one, are based on the names of two big doughnut companies, Winchell's Donut House, more common in the western US, and Dunkin Donuts, more common in the eastern US. Another factoid dealing with these doughnut cops and US geography; Wynchel is an eclair, which is apparently more common out west, and Duncan is a sugar ring, more common back east. For the recipe below, I did not use an eclair, but a maple bar, which caused Wynchel to be a little wider than he's used to. 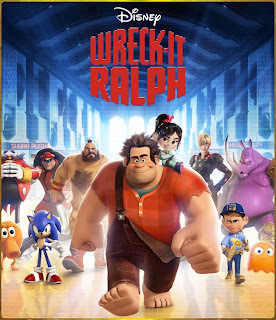 Thanks goes to my friend Melanie (who I saw "Wreck-it Ralph" with) for being such a good sport and making these with me! 1. Place the doughnuts on a parchment lined cookie sheet. On another sheet of parchment paper, roll the black fondant to about 1/8in. thickness. Using your paring knife, cut from the fondant the black shapes shown below (if you'd like, you can print the image & use the shapes as cutting guides. Right click on the image & select "save as". When you print it, make sure the image will print actual size & not scaled to fill the page). Place the cutouts on parchment paper & fold the fondant pouch cutouts on the dotted lines as shown above. Fashion two batons out of black fondant & place them with the rest of the fondant items. 2. Next, roll out the plain white fondant & cut out the rest of the shapes in the image above: circle, buckle, & star using a tiny star cutter if you have one. Place these shapes on a large plate & spray them with the gold color mist. Do not shake the can before spraying (the directions on the can say to shake, but by not shaking it, the gold color is more concentrated & the fondant is more evenly & appropriately colored). 3. Using the white cookie icing as glue, apply the fondant shapes in the appropriate places as shown in the images above & below, beginning with the black fondant pieces & then placing on the gold pieces. When applying the hats, take two small-ish blobs of black fondant, place one each on the top of the characters' heads, & affix the hat cutouts to the fronts so that the rims overlap the characters' foreheads. Shape & smooth the black fondant blobs so that they are hidden behind the hat shapes. 4. Attach the chocolate jimmies in the appropriate places using the cookie icing applied with a toothpick (eye brows on both characters & a mustache on Duncan--3 long jimmies on each side, 6 total). 5. If using the pink candy writer, heat the tube either in hot water or in the microwave for about 20-30 seconds. Stick a toothpick into the top to clear a path for the pink. 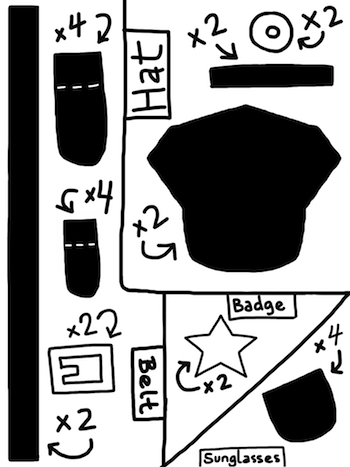 Very carefully, draw a tiny circle (doughnut) onto both of the gold star badges. Carefully layering the pink, build up noses for the characters, a long thin one for Wynchel & a fat round one for Duncan. If using pink fondant simply make tiny donut shapes to put on the badges & shape the noses & stick them on with cookie icing. 6. Spray a small puddle of gold color onto the plate & use your fine-tipped brush to paint a thin line around the rim of the sunglasses. Paint small gold dots on either side of the hats & a dot on the front of each belt pouch. 7. Lastly, carefully using a toothpick in an in & out motion, cut a somewhat threatening mouth on each character. Duncan & Wynchel reporting for duty! Ready to serve & protect Princess Vanellope!